Microsoft is shutting down its Windows Live Spaces blogging service and migrating an estimated 30 million of its users to the competing blogging site WordPress.com, owned by Web development firm Automattic. 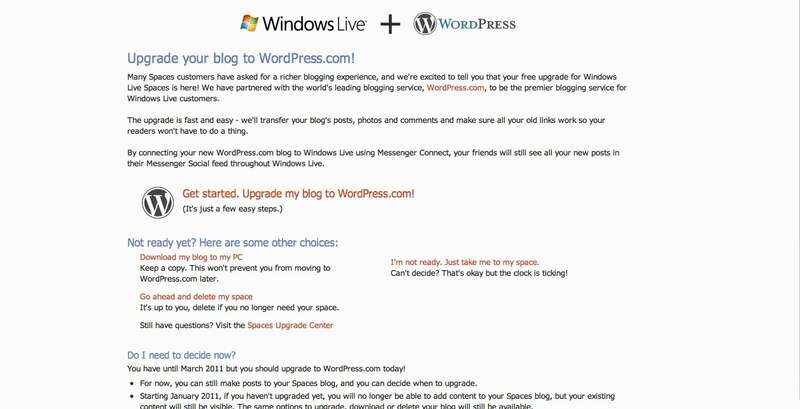 Microsoft says Windows Live Spaces users have six months to transfer content from their Live Spaces blog to the WordPress. Microsoft has provided a Web-based migration tool to help with the process. Roots of Windows Live Spaces trace back to 2004 when Microsoft first named it MSN Spaces and billed it as an "online scrapbook." Over the last few years Live Spaces was criticized for not offering a robust blogging platform similar to blogging competitors Google-owned Blogger and WordPress. Complaints ranges from difficulties uploading pictures, to lacking diverse blog templates, to having a poor user interface for programming text, video, and images into a blog. WordPress, on the other hand, is considered a successful blogging platform. It is used to manage over 26 million Websites and offers hosted and self-hosted versions of blogs. According to WordPress there are over 250 million visitors to WordPress.com blogs every month. If you are a Live Spaces blogger here's what you need to know about migrating to WordPress.com. Yikes, WordPress? But I don't want to host my own blog. While WordPress offers a self-hosted version of its software, WordPress.com is no different than setting up a blog on Google's Blogger or Live Spaces. The blog software and hosting options are already done for you all you have to do is sign up. The basic version of WordPress.com is absolutely free and includes 3GB of storage, a wide variety of themes to choose from, spam filtering and customizable widgets to add extra services to your blog such as a Twitter or Flickr feed. WordPress.com blogs cannot use the many third-party WordPress plug-ins available to self-hosted users. You can find an explanation of the differences between hosted and self-hosted WordPress blogs here. More advanced users can also pay for premium features such as extra storage, domain hosting and customizable cascading style sheets (CSS) to tweak your blog's layout. Just sign in to Windows Live Spaces, once you do you'll see a new splash page with a link called "Get Started. Upgrade my blog to WordPress.com." Microsoft will ask you to confirm that you want to move your blog, and then you'll be sent to WordPress.com to sign up. You can either add your Live Spaces blog to an existing WordPress.com account if you have one or you can sign in with your Windows Live ID. Once you've been authenticated, WordPress will take you through a four-step process where you create a WordPress ID, decide on a Web address such as example.WordPress.com and name your blog. You will also have the option to automatically notify your Messenger contacts when you add a post to your new blog. Once you sign up, WordPress will automatically begin migrating your Live Spaces blog to WordPress.com. The migration time will depend on the size of your blog, and WordPress will send you an e-mail when it's done. Your WordPress migration will include your blog posts, photos and blog comments. The migration will also try to filter out any spam comments. Your Live Spaces URL will automatically redirect readers to your new WordPress.com blog so you won't lose any of your regular readers. Your new blog will also notify search engines of your URL change to minimize any impact you might experience on your search results. You will not be able to take with you any of your draft posts, blog theme, guestbook, Windows Live gadgets. You will also lose any lists you've created such as a list of your favorite music or books. If you loved using the Live Spaces lists, WordPress.com allows you to add a text widget to your blog where you can re-enter the list. Just make sure you copy the list before migrating to your Live Spaces blog. If Windows Live Spaces is going away, what about Windows Live Writer? Windows Live Writer, Microsoft's free blog writing software for Windows-based PCs, will continue to be a part of Windows Live Essentials. Starting with Windows Live Essentials 2011, Live Writer will use WordPress.com by default. What's the deadline to move from Live Spaces to WordPress.com? You don't have to move to WordPress.com right away. Live Spaces users will have until March 2011 to move their blogs. But you can only add new blog posts until January 2011, after that Windows Live Spaces will no longer be accepting new content. Microsoft will continue to notify you that time is running out to migrate over to WordPress.com. If you decide not to move your blog by March 2011, your blog and all its contents will be deleted when Microsoft turns off Windows Live Spaces. I don't what to migrate to WordPress, what are my options? If you don't want to move to WordPress, you can permanently delete your Live Spaces blog or you can download your content as a compressed ZIP file. If you download your blog make absolutely sure you can open the compressed file. In my tests, the ZIP file of my Live Spaces blog was corrupted and I was unable to open it. Microsoft says you can use the contents of your ZIP file to upload your blog contents to another platform such as Blogger or Live Journal. Will my new blog integrate with Windows Live? 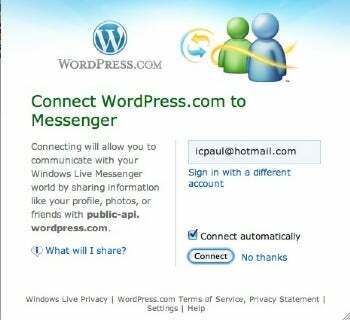 If you choose to publicize your new WordPress.com blog using Microsoft Messenger, a link to your new blog will be added to your Windows Live Profile. Also, any new blog posts will appear in your profile's Messenger Social feed.